Xafari Framework is often used for development of large business applications handling such tasks as manufacturing or asset management. These applications usually have dozens or even hundreds of users and need to be updated regularly in order to correspond to the ever-changing market and industry requirements. This leads to various issues related to maintaining different versions of the system for different users or groups of users. Different user groups can use different versions of the application. Different user groups might need to upgrade to new versions of the application separately depending on which new features are important for which user group. 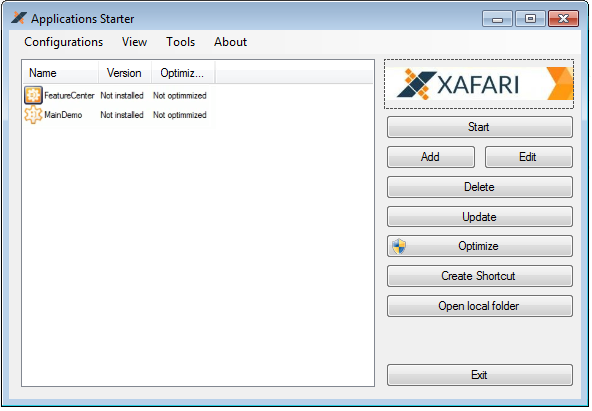 In order to simplify the administration of Xafari applications, we have developed Xafari Application Starter utility, or AppStarter. AppStarter is a separate Windows application that is installed on the end user’s machine and helps to create and manage local copies of the required versions of the Xafari application. After the user or administrator launches AppStarter on the local computer, they can add required application versions to the user’s list from the file server of the corporate network, update and delete the versions of the application already installed on the user’s computer. Thus, AppStarter allows running and working with different versions of the same application and configuring individual lists of application versions to be run for each user. When the application is started, the utility checks the currently available application version and downloads the up-to-date version. For simpler application usage, the utility allows creating a shortcut on the desktop for each used application. AppStarter is also used to track all updates of the current versions in order to prevent using outdated application assemblies. Another important feature of AppStarter is optimizing the local application copy’ code with the help of ngen.exe utility. Last, but not least, when used in combination with Xafari.Accelerator, AppStarter improves application performance by reducing application start time by at up to 3 times on the client computer.